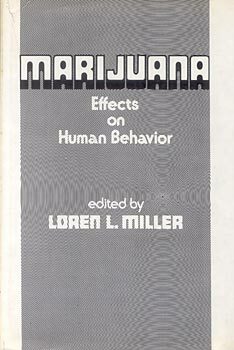 This book summarizes recent scientific evidence concerning the effects of marijuana on human behavior. It not only reviews acute and chronic laboratory effects of cannaboinoids on cognition and psychomotor performance, but covers more controversial topics: the relationship of use to aggressive behavior, progression to more dangerous drugs of abuse, the development of psychiatric illness, and effects on driving. The book places emphasis on the unbiased summary and interpretation of relevant data on a given topic. Many of its fourteen chapters cover new and original material not previously published. It will be of interest to clinical investigators and researchers in pharmacology, as well as psychologists, psychiatrists, sociologists, lawyers, and legislators.